We went to Nada, Aqua, and back to the Convention Center for the end of Art Basel (another 3 hours of seeing work we never even touched on the last time we were there). Nada is one of the other shows which was for new gallerists. From the pictures above, it was wonderfully done in an old warehouse, with the yard transformed into a hanging out space with lots of white paper lanterns, red hammocks everywhere, a stage with art performances, chairs, and dining spilling into the space. Inside was a range of work with one of my favorites (posted) of these naive drawings of greek urns. Lots of ink washes, large format drawings and black and white graphic images galore. I guess in the art world, black and white has not gone out of style. It was very artful work at Nada--less commercial in feel than those at Aqua (who I adore) but who are many who may have come to art through the graphic design and/ or (god forefend) the illustration channel. Aqua was fun though it felt a little lighter this year. As usual, there were the juxtapoz hitters like Billy Shire and someone I didn't know, Jack Fischer from LA. Another great gallery was Works Project who had some interesting painting/type compositions. Needlepoint, weaving and embroidery--big--saw a collection of needlepointed pictures/pillows beautifully finished of the Jackie Kennedy photographs the day/moment JFK was assassinated, another grouping was of needlepointed pieces that were the graphics from cereal boxes. Someone wove (huge, gigunda) reciepts from the airport (with type). There were organza renderings of plastic shopping bags with embroidery for the graphics. When we went back to the Convention Center, I was thrilled out of my gourd to see that there were two Yinka Shonibare pieces which are as usual, dynamic, exciting and now a day later, thought provoking. 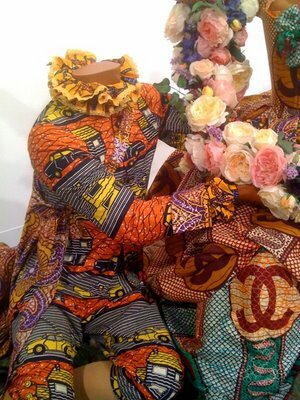 Shonibare creates costume/theatre, manikins to establish a visual story that points up conditions in history and in our culture that reflect africa, colonialism, fashion. I have talked about him previously in an installation we saw of his at MassMoca of costume and a dance performance they showed on a monitor. More to say on this. I do not have my notes at hand, so that will be another posting of new people to get to know and see, ideas and sketches. I just wanted to share a bit before the day begins today. Off to find uniform ideas for the hot glass workers. Teeshirts with screenprinting is just too heavy and do not breathe. There is packing to do, phone calls to make and all to get ready as we have a direct flight to Syracuse tonight (getting us home around midnight). As blissful as it has been to be in this eden, I will be glad to be back to cold weather and snow. Much to do, so you, my friends will have to be short. I will send mini postings from my phone (new blog app that works great...just my spelling with the texting can be a bit odd). Tomorrow, then.